R20 laser tattoo removal Is a great way to get rid of unwanted ink. The R20 laser tattoo removal method is a way to get more ink broken up with fewer office visits. Skin City Laser is one of the only Las Vegas shops providing this treatment. This means fewer visits to your laser technician. Less time and less money. After R20 laser tattoo removal is a type of tattoo removal that is based on principle of repeated exposure of laser light in a single session. So you recieve three treatments in one visit. The frosting created prevents penetration of further laser light in the dermis. If we wait for some time, approximatly 20 minutes, the frosting subsides and laser can work again. This process is best used by clients who either live far from their laser technician or would prefer to only treat area twice a year. This process will break the ink up three times so that the white blood cells have ample time to process the ink. The laser energy is delivered using the same parameter and a gap of 20 min is given in between each pass. The frosting observed after first pass may not be evident during subsequent passes. Still it is recommended to wait for 20 min because there may be intracellular steam formation. This type of tattoo removal can be more aggressive than the single pass method. Experiencing a higher efficacy of this method at the end of 4 months in tattoo clearance when compared to standard method. The theory behind this more aggresive approach is more ink faster. You are breaking the ink up threetims more per visit. The assumption is a more rapid absorption of ink. 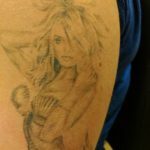 There are many advantages to this type of tattoo removal. 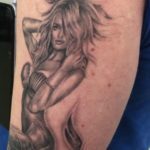 The number of sessions required for tattoo removal is slightly reduced thus decreasing the number of visits to the clinic and increasing patient compliance. The original studies showed that it is can be more effective but is slightly more aggressive on the skin.